Peanut allergy is considered to be one of the most severe food allergies and is estimated to affect one percent (1%) of the American population (Agagnostou & Clark, 2014). Currently, there are no cures, and intervention strategies for reducing the hypersensitivity to allergies include complete avoidance of allergen or foods and/or costly immunotherapy procedures which can impact the overall quality of life for sufferers of peanut allergies. 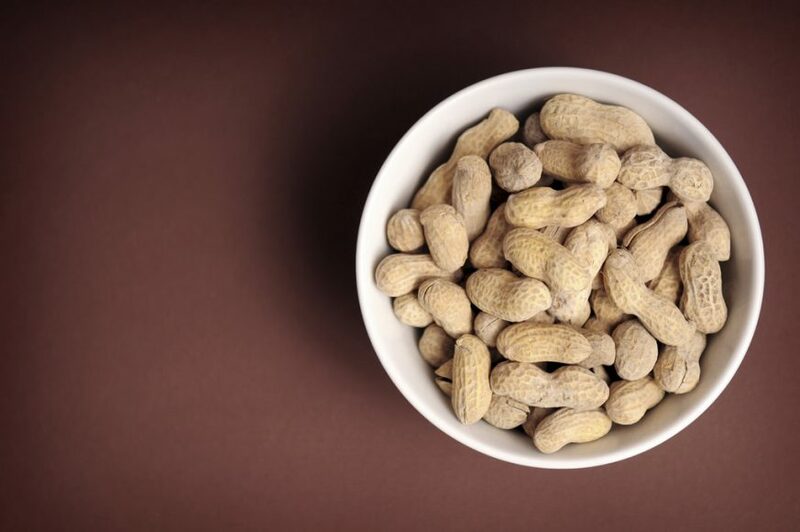 Peanut allergies present one of the highest risks, and there is a strong interest in developing novel therapeutic strategies to reduce the severity of the hypersensitivity or reactions to products that potentially contain peanuts to sensitive patients. These strategies include enzymatic treatments, pulsed UV light treatment, genetic modification, and oral administration of polyphenolic compounds to individuals to non-specifically counteract an allergic airway inflammation (Chung, Yang, & Krishnamurthy, 2008; Cabanillas et al., 2012; Fu et al., 2010; Nyanhanda, Gould, & Hurst, 2014). Plant polyphenols are naturally occurring compounds found mostly in fruits, vegetables, cereals, and beverages. Fruits, such as grapes, cherries, or berries, contain up to 200–300 mg polyphenols per 100-gram fresh weight. Products manufactured from these fruits also contain polyphenols in significant amounts (Scalbert et al., 2005; Spencer et al., 2008). One group of polyphenols, procyanidins, a flavonoid that has been shown to reduce allergic biochemical markers, including a reduction in serum IgE, histamine and the high-affinity IgE marker (FcεRI)- mediated mast cell activation in vivo (Aswar et al, 2015; Nakano et al., 2008). In previous investigations, our research team found that procyanidin-rich cranberry and blueberry polyphenol, when combined with peanut protein, significantly reduced the binding of immunoglobulin E (IgE) antibodies to peanut allergens and release of histamine and β-hexosaminidase in a complementary in vitro assays. This study led to the development of a modified peanut protein – cranberry or blueberry polyphenol complexes with significantly reduced allergenic potential from two Vaccinium species. (Plundrich et al., 2017). Consumption of peanuts with the skin is not aesthetically appealing or palpable for some consumers. However, researchers have found that peanuts skins are not only rich in beneficial compounds, but they can be used to help in lowering plasma lipid levels, reducing fat, protecting against heart disease, cancer or stroke (Gonzalez and Salas-Salvado, 2006; Francisco, 2008; Bansode et al., 2014) and potentially serve as a way to reduce hypersensitivity to peanut allergens. Researchers at North Carolina Agricultural and Technical State University Center for Excellence in Post-Harvest Technologies and North Carolina State University have demonstrated the anti-antigenic properties of peanut skins’ polyphenols-enriched peanut protein mixture. This investigation found that complexation of peanut skin polyphenol extracts blended with certain concentrations of peanut flour can significantly reduce serum IgE levels, suppression of β-hexosamindase, histamine production, and expression of key proteins associated with basophil cell-mediated allergic responses from plasma isolated from peanut-sensitive individuals (Bansode et al., 2018). More importantly, peanut skin polyphenolic extracts when mixed with peanut flour (aggregates) can potentially serve as a novel immunotherapy strategy in human to reduce peanut hypersensitivity in allergic individuals by reducing immunoglobulin Epsilon (IgE) binding capacity and mast cell degranulation which is linked to the pathophysiology of anaphylaxis and other acute allergic reactions. These findings are described in the article entitled Peanut flour aggregation with polyphenolic extracts derived from peanut skin inhibits IgE binding capacity and attenuates RBL-2H3 cells degranulation via MAPK signaling pathway, recently published in the journal Food Chemistry. This work was conducted by Rishipal R. Bansode, Priscilla D. Randolph, and Leonard L. Williams from the North Carolina Agricultural and Technical State University, and Nathalie J. Plundrich and Mary Ann Lila from North Carolina State University. Anagnostou, K. & Clark, A. 2014. Peanut immunotherapy. Clinical and Translational Allergy, 4:30. Aswar, U.M., Kandhare, A.D., Mohan, V., and Thakurdesai, P.A. 2015. Anti-allergic effect of intranasal administration of type-A procyanidin polyphenols based standardized extract of cinnamon bark in ovalbumin sensitized BALB/c mice. Phytotherapy Research 29:423-433. Bansode, R., et al. 2014. Bioavailability of polyphenols from peanut skin extract associated with plasma lipid lowering function. 2014. Food Chemistry 148:24-29. Bansode, R., et al. 2018. Peanut flour aggregation with polyphenolic extracts derived from peanut skin inhibits IgE binding capacity and attenuates RBL-2H3 cells degranulation via MAPK signaling pathway. Food Chemistry 263:307-314. Cabanillas, B. et al. 2012. Influence of enzymatic hydrolysis on the allergenicity of roasted peanut protein extract. International Archives of Allergy and Immunology, 157:41-50. Chung, S.Y., Yang, W. and Krishnamurthy, K. 2008. Effects of Pulsed UV‐Light on Peanut Allergens in Extracts and Liquid Peanut Butter. July 2008 Journal of Food Science 73(5):C400-4 DOI:10.1111/j.1750-3841.2008. 00784.x. Francisco, ML, Resurreccion, A. 2008. Functional Components in Peanuts. Crit Rev Food Science and Nutrition. 48:715-746. Fu, G. et al. 2010. Epigenetic regulation of peanut allergen gen Ara h 3 in developing embryos. Planta 231:1049-1060. Gonzalez C, Salas-Salvado J. The potential of nuts in the prevention of cancer. Br J Nutr,2006;96(2):87-94. Plundrich, N., Bansode, R., Foegeding, E., Williams, L., and Lila, M. 2017. Protein-bound Vacciium fruit polyphenols decrease IgE bindg to peanut allergens and RBL-2H3 mast cell degranulation in vitro. Food & Function 8:1611-1621. Nakano, N., Nishiyama, C., Tokura, T., Nagasako-Akazonme, Y., Ohtake, Y., Okumura, k., and Ogawa, H. 2008. Procyanidin C1 from apple extracts inhibits Fc epsilon RI-mediated mast cell activation. International Archives of Allergy and Immunology. 147:213-221. Nyanhanda, T., Gould, E. M. and Hurst, R.D. 2014. Plant-derived foods for the attenuation of allergic airway inflammation. Current Pharmaceutical Design, 20:869-878. Scalbert A, Manach C, Morand C, Remesy C. 2005. Dietary polyphenols and the prevention of diseases. Critical Reviews in Food Science and Nutrition. 45:287–306. Spencer JP, Abd El Mohsen MM, Minihane AM, Mathers JC. 2008. Biomarkers of the intake of dietary polyphenols: strengths, limitations and application in nutrition research. British Journal of Nutrition. 99:12–22. Leonard L. Williams is a PhD and Polyphenols researcher at North Carolina Agricultural and Technical State University | NC A&T.